My husband, hungry_hobbit for those who need reminding, never tried *gasp* fresh asparagus until he was all growns up, or in my mind, till he met me. His mom fed him canned asparagus (I am told she still prefers canned to fresh to this very day.) He’d probably never eaten so much of this spindly vegetable all in a row, either, till he met me–we ate asparagus almost every day for a week when I was doing an assignment on this elegant spear. We had green, purple, and white asparagus; stir fried, made into mousse, pureed into a potage …. Anyway, I digress. I have to make one exception: canned corn. Somehow or another, corn kernels manage to stay sunshiney–both in color and disposition–sweet, and crisp under cover of anodized tin, a far cry from its mushy and dingy-looking carrot and green pea counterparts. And if you’ve never had canned rutabaga, otherwise known as swede in England where I first had it … ugh …don’t. And get ready for this, I love cream-style corn! I guess it’s like durian, I grew up eating it and it’s one of my all time favorite things to eat. With the addition of a little water and starch, cut corn is transformed into a batch of creamy goodness. 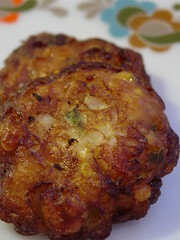 When I was growing up, my mum turned canned creamed corn into two simple dishes: corn soup and corn fritters. 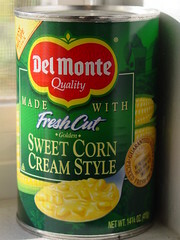 I was surfing the internet for fun nuggets on cream-style corn and I found this 11-page document published by the U.S. Department of Agriculture: “United States standards for grades of canned cream style corn. Effective July 1, 1957.” The document’s chapters go into great detail about identity, colors, rating factors, consistency, flavor, and tenderness, among other things. I never knew that canned corn, or canned anything for that matter, was held to such high standards. Take note, you only want U. S. Grade A or U.S. Fancy. I’ll never look at canned creamed corn the same again. 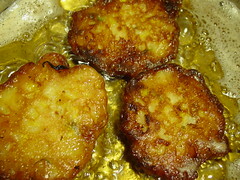 These corn fritters can be eaten as a snack or as part of a meal with rice. My mum likes to add finely chopped kaffir lime leaf to add fragrance and flavor. I didn’t in this recipe but for those who don’t make it to the Asian grocery store often enough, snip lemon verbena leaves instead for a similar citrusy scent and savor. In a medium bowl, combine all ingredients except oil. Mix well until no large lumps are left. 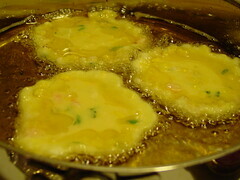 In a skillet, heat oil over medium-low heat until shimmering. Fill a 1/4 measuring cup slightly less than full of batter and slowly dribble into hot oil to form a mound about 2.5″ in diameter. The patties will not be totally submerged. Cook until golden brown ruffles form around edges. About 5 minutes. Flip with tongs or spatula and cook for another 3 to 4 minutes until cooked through. 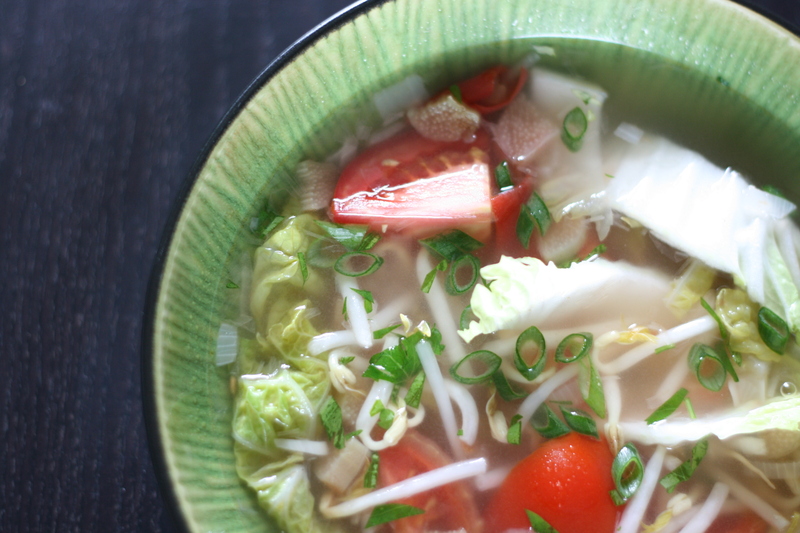 This soup is perfect for a cold, dreary day and anytime you want an easy light lunch. My basic recipe comprises only two ingredients: one can of cream-style corn and an egg. But if you want to get a little fancier, just like at the local Cantonese restaurant, you can add chopped crab meat, ham or chicken, and a dash of Chinese wine or sherry. In a medium saucepan, combine cream-style corn and water or broth (no need to pull out the measuring cups, just fill half the can with liquid). Bring to boil over medium heat. About 3 minutes. Stir in the salt and white pepper (now’s also the time to add wine or cooked meat if using). Turn down heat to low and pour egg into soup in a steady stream, and quickly stir in one direction until skinny ribbons form. Remove from heat. Drizzle with sesame oil and garnish with green onions.